Kentucky stayed perfect with a sweep of South Carolina, while Florida got back on the winning track with a sweep of Mississippi State. Missouri and Tennessee survived five setters to keep pace. The win secured Florida its 10th SEC victory, a plateau the Gators have reached in each of their 28 seasons under Mary Wise. The victory kept Florida perfect in the all-time series against the Bulldogs at 51-0, including 47 sweeps. Florida outdid Mississippi State in kills (41-33), hitting efficiency (.252 to .070) and blocks (9-6). The Bulldogs edged the Gators 3-2 in aces. Paige Hammons (12) and Holly Carlton (11) led the Gators offensively, while Rachael Kramer put up a team-leading six blocks. Paige Shaw turned in 11 kills for the Bulldogs, but hit just .049 for the match. Amarrah Cooks added eight kills and four blocks, while hitting .211. Mississippi State scored four of the first five points of Set 3, but Florida turned the tables with a 6-2 run. The Gators boosted their lead to four at 18-14 and held on for the victory, although the Bulldogs cut the margin to one twice (19-18 and 20-19). Florida sealed the sweep with a 5-1 run, with a kill by Hammons closing the door at 25-20. It was a great day to get back & play on the road! A win and 🐊🧹! Kentucky stayed perfect in SEC play at 10-0 with its 13th straight victory. The Wildcats put up 11.5 blocks (to 6) and outhit the Gamecocks .245 to .101. UK also boasted a 36-29 lead in kills and 4-3 edge in aces. Leah Edmond (11 kills, 7 digs, .200) and Alli Stumler (10 kills, 5 blocks, 4 digs, 2 aces, .280) led the way for the Wildcats. Claire Edwards paced South Carolina with eight kills on a .400 hitting effort to go with a team-best four blocks. Aubrey Ezell set the South Carolina rally scored era season record for aces with 54, the most for a Gamecock player since 1998 and one ahead of Megan Hosp’s 2002 tally. Kentucky faced a 12-7 deficit in Set 3. After a timeout, the Wildcats put together a 7-2 run to tie it up at 14 on an Edmond ace. Later, trailing 18-16, Kentucky scored five straight to claim a 21-18 lead on back-to-back kills by Madison Lilley. The Gamecocks thwarted two Wildcat match-point tries at 24-21, before Stumler wrapped up the match at 25-23. After trailing the Bulldogs in hitting percentage in the first two sets, Tennessee managed a .406 effort in Set 3 and edged Georgia the rest of the way, including .350 to .150 advantage in Set 5. For the match, the Vols outhit the Bulldogs .263 to .248. Tennessee boasted a 71-58 lead in kills and a 12-9 edge in blocks en route to their fourth straight win. 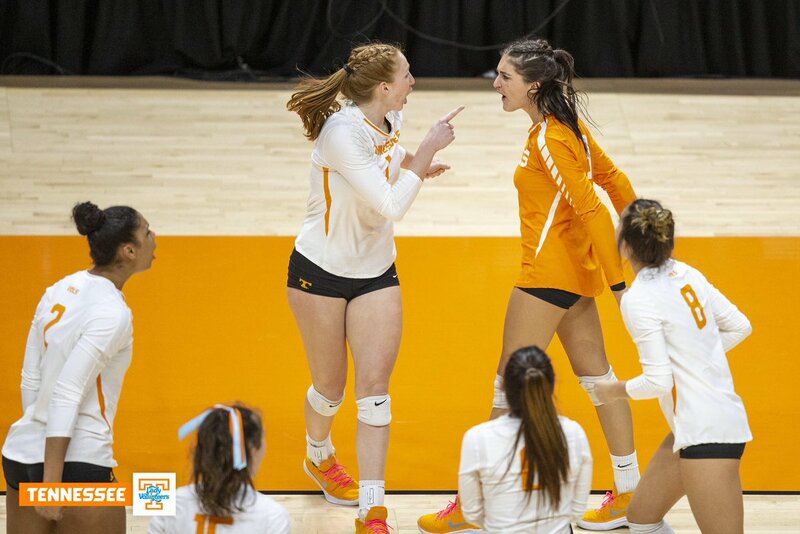 Tennessee’s Tessa Grubbs racked up a career and match-high 27 kills on a .349 hitting effort, while Erica Treiber (16) and Lily Felts (13) followed. Treiber hit at a team-best .520 clip, while Felts rounded out a double-double with 10 digs. Addisyn Rowe accounted for eight of the team’s 12 blocks. T’ara Ceasar posted 21 kills, while Rachel Ritchie (15) and Majesti Bass (10) also managed double-digit efforts for Georgia. Bass hit at an errorless .455 clip (10-0-22) and put up three blocks alongside Ceasar. The Vols finished off the comeback win by taking a 7-4 lead in Set 5 and staving off two Bulldog rallies. Georgia was within one at 7-6 and 9-8, before Tennessee managed six of the final nine points. Two kills by Grubbs and a Treiber ace helped the Vols to a 14-10 lead. A stuff by Rowe and Alyssa Andreno clinched the win two points later. Auburn hit .538 in Set 1 en route to a .371 effort for the match to register their second straight victory. Arkansas started the match with a .310 clip, before stumbling to a .096 mark in Set 2 and finishing with a .202 overall effort. The Tigers held the advantage in kills (50-39), aces (5-3) and blocks (8-3). Brenna McIlroy registered 14 kills to lead all hitters, while hitting .278 and adding eight digs and two aces. Tatum Shipes (12) and Anna Stevenson (11) also turned in double-digit kill efforts. Stevenson hit .625 and notched a team-best six blocks alongside Mica Allison. Elizabeth Pamphile downed 10 kills at a .348 clip and added a team-best two blocks. Hailey Dirrigl (9), Logan Brown (8) and Kelly O’Brien (7) rounded out the offensive leaders. Arkansas led by as many as five (9-4) in Set 3 before Auburn narrowed the gap to one at 13-12. Down 16-13, the Tigers scored four in a row, including an ace and a block by Stevenson to grab a 17-16 lead. The Razorbacks were back on top at 22-20, but Auburn had the first chance at the set at 24-23. After two more Tiger tries, Arkansas earned two set-point attempts of its own at 27-26 and 28-27. In the end, two McIlroy kills and one by Stevenson closed out the 30-28 Auburn victory. Head coach Wayne Kreklow notched his 300th win with the Tigers (300-144). The Tigers posted their 20th win of the year and moved to 4-1 in five-set matches while registering their eighth straight win. Texas A&M meanwhile played its 10th five-setter of the year, marking the most in the rally scoring era. Mizzou was slightly better in every way: kills (66-57), efficiency (.279 to .204), aces (4-3) and blocks (12-11). Four Tigers managed double-digit kill tallies: Leketor Member-Meneh (17 kills, .432), Kylie Deberg (16 kills, 15 digs), Dariana Hollingsworth (12 kills, 5 blocks, .029) and Tyanna Omazic (10 kills, 5 blocks, .353). Andrea Fuentes dished out a career-high 61 assists, the most since Nov. 24, 2010, when volunteer assistant and Mizzou All-American Molly Kreklow posted 62 against Oklahoma. London Austin-Roark (15 kills, 4 blocks, .440) and Hollann Hans (13 kills, 18 digs, 8 blocks) paced the Aggies. Mizzou outhit A&M .308 to .040 in the decisive fifth set. Trailing 3-2, the Tigers outscored the Aggies 10-1, including five Texas A&M miscues and three Member-Meneh kills. The Aggies scored four of the next six, thwarting two Missouri match-point tries, before an Alyssa Munlyn kill ended the night at 15-8. Spanning over 14 years as the leader of #Mizzou Volleyball, head coach Wayne Kreklow tallied win No. 3️⃣0️⃣0️⃣ today. Ole Miss overcame deficits in kills (66-61), aces (5-4) and blocks (12-9) to grab the victory. The Rebels outhit the Crimson Tide .256 to .231 and committed just 18 errors to Alabama’s 24. Emily Stroup (19 kills, 15 digs), Caitlin Wernentin (17 kills, 19 digs, .341) and Nayo Warnell (10 kills, .391) highlighted the Ole Miss effort. Mahalia Swink (19 kills, 16 digs, .342), Ginger Perinar (18 kills), Doris Carter (13 kills, 13 digs, .300, 3 blocks) and Hayley McSparin (11 kills, 6 blocks, .280) accounted for the Alabama scoring. The Rebels built an 11-6 lead in Set 4 with help from four Alabama miscues, three Aubrey Sultemeier blocks and two Wernentin kills. The Crimson Tide cut the margin to three at 18-15, but it was nearly all Ole Miss from there as the team ended the night with a 7-4 run, capped by kills by Wernentin and Stroup.